Unit 20, stratum 6a. was recovered at about 2.1 m below surface. 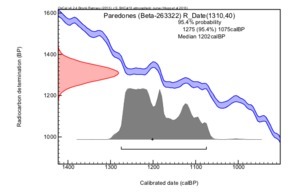 Because this sample is very recent relative to the many other dates obtained from this deposit, the excavators reject it, along with AA-86938 obtained on another uncharred cob nearby (Grobman et al. 2011:1756).